You know what they say about big guys with rocket launchers for an arm, right? Deep in an uncharted jungle, an elite band of mercenaries are ambushed by an army of goons in hockey masks, armed with clubs. After laying the madmen to waste in a hail of bullets, the mercs finally find what they were searching for; a wallet belonging to a buxom blonde cheerleader, eager to tag along. Did I mention she has a twin? Before you ask: no, you’re not reading an entry from my dream journal. I’m talking about one of the many scenarios in Alpha Squad, the action-packed top-down shooter from developer Dragon Divide, available in the Xbox Live Indie Game library. Are you ready to throw down 240 MS points ($3) for this tale of guns, guts, girls and glory? Or, are you a big sissy who doesn’t like giant guns, hot chicks and other classic video game clichés? The first impressions of Alpha Squad are quite promising. Heavy rock tunes and eye-opening manga-style artwork accompany a robust set of menus and options before launching into gameplay. Players take control of one of four mercenaries; Clint, Jin, Lynx or Lackey, as they blast through waves of enemies one overhead screen at a time in a fashion very similar to classic arcade top-down shooters such as Smash TV and Total Carnage. Progress is made by completing stages, defeating bosses, collecting money to buy items and weapons, and unlocking secret items and sub-quests. Also similar is the humorous tongue-in-cheek vibe, as demonstrated in the textual banter between characters, cartoonish over the top violence and the unusual cast of villains. Mutants with cannons for arms, radioactive slime, gorillas armed with guns and cloned Japanese school girls are just some examples of the enemies Alpha Squad has to offer. 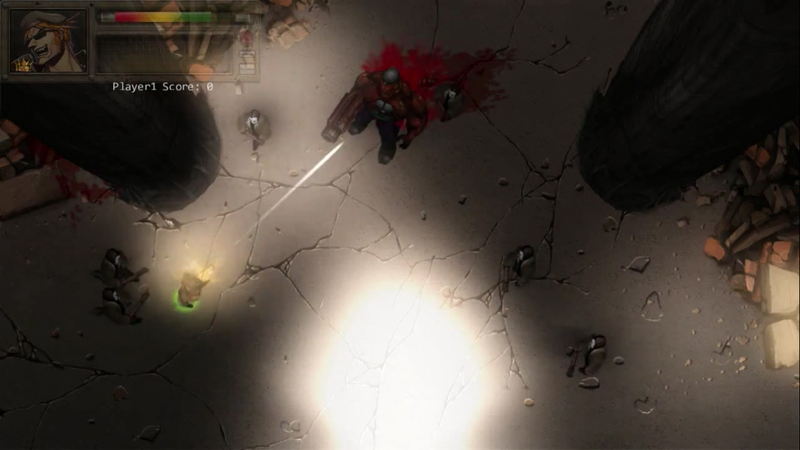 Controls are very much akin to other dual-stick overhead shooters; the left stick controls the character’s eight-directional movement while the right stick controls the weapon’s trajectory. Pressing B will use any equipped health or power-up item and the A button is used to interact with the environment, e.g. talk to friendlies and search for items. The idea is to avoid the onslaught of aggressive enemies and reduce them to bloody chunks. The mercenaries run and gun smoothly at just the right speed, making the game easy to pick up and hard to put down. It’s fun, addictive, and occasionally, intense. As with any game, the further you advance, the more challenging it gets. You only get one life per stage, but unlimited continues and a save system aid your progress. Some of the later stages have moments of overwhelming enemy fire and questionable cheap enemy spawning where it’s not uncommon to be obliterated in a matter of seconds. This is all the more reason to grab some trigger happy friends and take advantage of the co-op modes. A total of four players can team up online or locally to take on the hordes of diverse enemies that await in the Story mode or the score competitive Arena mode. All four characters in the roster play identically to each other without having unique attributes, so all players are on equal footing when it comes to destroying the Alliance and trying to outscore each other. Alpha Squad doesn’t skimp on the weapons, each with a different look, range and strength that suits various combat situations. Optional arms and items, such as shotguns, flamethrowers, health and revival packs, power-ups and shields are available for purchase in a shop menu that can be accessed anytime during gameplay or occasionally dropped by a fallen enemy. The higher-priced weapons like the homing lightning bolts of the Zeus Cannon and the void inducing Vortex Launcher can help tilt the odds in your favor in the later stages when things get fiercer. Each player can hold only one item and one weapon in their inventory, which unfortunately keeps the strategy of stocking up for the big battles nearly impossible. Players don’t have the ability to switch back and forth from the standard unlimited ammo machine gun and their acquired weapons. Once you get a new weapon, you’re stuck with it until it runs out of its ammo. Picking up a dropped gun from an enemy or buying from the shop menu also works, but this can become a frustrating aspect when accidentally picking up a weapon or health item that is inferior to the one you have equipped. Luckily, the shop menu is accessible anytime so if you have enough gold and silver from destroying Alliance scum, you’ll always be in good shape to upgrade your limited stash. To some, arcade style shooters have the potential to be become repetitive and tiresome very quickly. Thankfully, Alpha Squad is packed with fun and replay value. Most stages consist of several enemy screens that pan out in different ways. On your first play through, you may encounter a boss battle at the end of your path. Trying a different way can lead you to a sub-mission to assist one of the many lovely damsels in distress, rewarding you with secret items, passageways to new stages, and fan-service artwork in a gallery labeled as the Sanctuary. Gamers with even the slightest sense of exploration will be enticed to find all stages, complete all quests and perhaps an alternate ending or two. For the high score achieving types, playing the Arena mode delivers the old school objective of scoring the most points to be top dog on the leaderboard. The pixel art and lighting effects in the game are very crisp and well animated, as it traverses along diverse and detailed hand-drawn environments, such as thick jungles, fallen cities and fierce snowstorms. Enhancing the vibe of this overall solid game are two star players I really need to give it up to; the gorgeous character artwork by artist Genzoman and the hard-hitting soundtrack by Stemage. Those who are not fans of the style might be the ones to point out the tired cliché aspects of the game (e.g. video game mercenary stereotypes, wide-eyed women with large breasts, silly comical banter, loud heavy metal tunes, etc). But, the overall execution and presentation is so well polished it’s hard not to like it. On a technical level, the game admittedly could have used a little more tweaking, considering I encountered an occasional game crash or two and some online lagging and bugs. Hopefully, these are issues that could be resolved with future patches. Developer Dragon Divide delivers top bang for your buck with Alpha Squad; an action-packed top-down shooter featuring four player co-op, shredding tunes and amazing artwork. Minor quirks and glitches don’t get in the way of putting hours into this stuffed $3 package. Budget gamers & Smash TV fans should go out and get this now!